NEW YORK--(BUSINESS WIRE)--Index Industry Association (IIA), the first-ever trade association for the index industry, today announced the results of its second annual global index survey. The IIA is the only industry body to quantify the complete index universe and according to its latest analysis, there are 3.727 million indexes globally. This represents an increase of approximately 438,000 indexes since the survey was first conducted in June 2017, a 12 percent rise in the past year. The current survey, which was conducted as of June 30, 2018, sought information only about the total number of indexes administered by each of the fourteen IIA members. It is estimated that these indexes represent approximately 98 percent of all indexes globally available. 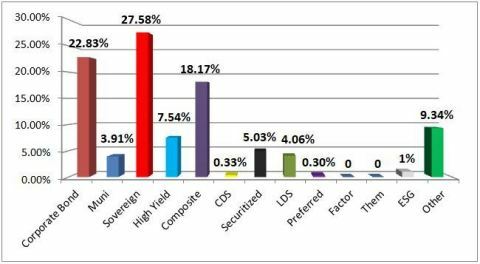 According to the survey, fixed income saw the largest growth compared to other asset classes. As a result, fixed income indexes now represent approximately 16 percent of the overall index universe. The significant increase in this asset class was due to a number of factors including new product innovation, demand from investors for more precise exposures and some consolidation of index families to independent providers. The survey shows the greatest growth in a number of fixed income categories, including composite and municipal bonds. When looking at fixed income growth by geography, the Americas represent approximately 36 percent of total fixed income indexes available, rising 3 percent year-over-year. EMEA (31% overall) saw a 2 percent increase and Frontier/Emerging markets experienced the largest increase, growing nearly 7 percent to approximately 7.5 percent of overall fixed income indexes by geography. APAC (9% overall) and Global (17% overall) fell 5 percent and 8 percent year-over-year, respectively. To hear more about the opportunities and growth in fixed income, click here to view an IIA Educational Video. According to the survey, the total number of equity indexes dropped by 3 percent globally to 3,068,871. Sector-focused indexes was the only category to experience a decline, as the number of sector indexes dropped from approximately 43 percent to 40 percent of total equity indexes. The most dramatic increase came from Environmental, Social & Governance (ESG) indexes, which grew 60 percent in the total number of indexes year-over-year. “The data shows that overall number of equity indexes remained rather consistent across most categories. However, the growth and innovation in ESG, Factor and Smart Beta indexes over the past year has been impressive. While these areas still represent a small portion of the total index landscape, investors are demanding more choices and as a result, providers are creating new indexes where they can offer more targeted exposure,” Redding continued. Global indexes still represent the majority of equity indexes by geography at approximately 30 percent, but the largest growth came from APAC which saw a 2 percent increase year-over-year to approximately 26 percent of total equity indexes. EMEA and frontier/emerging indexes now represent 22 percent and 13 percent of indexes globally, while the Americas have the fewest number of equity indexes at 10 percent. IIA was founded as the first-ever trade association for the index industry, and is continuing its expansion to serve the global investor community. Created as a not-for-profit organization for the fast-growing community of index providers, the IIA membership is open to independent index administrators worldwide. All IIA members separately submitted this information to the IIA and the IIA has not shared it among the members other than in the aggregate form made available to the public. The amount of assets under management benchmarked to these indexes was not in the scope of this project as independent index administrators do not have complete access to this data. IIA is an independent, not-for-profit organization based in New York that represents the global index industry. Founded in March 2012, the association is the first ever index industry trade body and it is committed to representing the global index industry by working with market participants, regulators, and other representative bodies to promote competition and sound practices in the index industry to strengthen markets and serve the needs of investors. Our members have calculated indices since 1896 and today administer over three million indices for their respective clients covering a number of different asset classes, including equities, fixed income, commodities, and foreign exchange.